I try to avoid talking about other critics online. Now there are times I can't avoid it - if I'm collaborating with someone it's bound to come up, and we're always curious on some level what other people might say or think - but to me we've all got our own lanes and approaches, and as long as things stay civil I'm generally pretty pleased. And full disclosure here, I actually have collaborated with an affiliated member of the group behind the artist I'm covering today, where they actually sent me the project to review in full. That doesn't mean I'm going to go easy on anybody - I'd be less of a critic if I did - but I feel it's necessary to provide context. 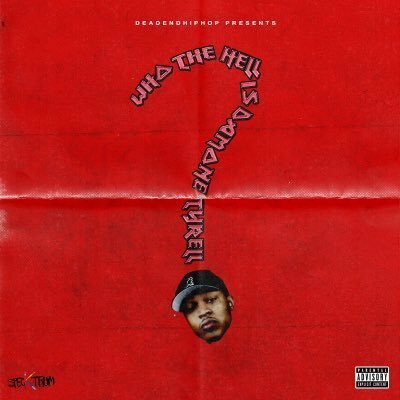 So, for all of you who saw the name of this artist and then asked the question in the title of his album, Damone Tyrell is an Atlanta MC by way of Buffalo who at the last minute decided to compete in an open mic competition called The Bar Exam when he learned it would be judged by the team over at Dead End Hip Hop. And hell, if I was an aspiring MC, I'd probably give it a shot too, but when Damone won he attracted some real attention, which led to a congregation of producers to give this guy a real independent push. And before I even start with the review, let me stress how much I admire this sort of idea - they've always said that Dead End Hip Hop is a movement beyond the reviews, and with projects like this and The Joint mixtape last year, I can definitely respect the idea of becoming the force not just of promoting the music you love, but enabling its creation. But I've wasted enough time - let's ask the big question, who the hell is Damone Tyrell? Honestly, coming out of this record, I wish I had a firmer answer to that question, and I wished this project was stronger. It's far from bad, don't get me wrong, but it's also the sort of project I wish had more individual flavour and personality, the sort of record that would more firmly establish both Damone Tyrell and the artists that are to be backed by Dead End Hip Hop going forward. In other words, Who The Hell Is Damone Tyrell? is a solid enough debut, but this is also the sort of project that could have used more meat to really flesh it out. So let's start with Damone Tyrell himself - and overall he's a pretty good MC. HIs bars are well-structured, his voice is well-balanced in the mix, and while there are a couple flows I think feel a tad awkward, overall he reminds me a lot of the technically strong underground scene which I tend to like. He does sing a little on this record on a few hooks, but there are songs where he'll have one continuous verse and for the most part that's fine, even if I do think there are moments on this album that could use a punchier hook. There is some smart wordplay and I do appreciate how Tyrell is able to balance both a more aggressive persona versus a more restrained delivery on songs like the two sides of 'Illusions Of Gangsta', the sort of song that makes me wish Tyrell had been more willing to get more conceptual across the entire record. And this takes us straight into the content, and what helps Tyrell stand out. From what I can gauge, much of this record is caught up in an interesting dichotomy: between pursuing hip-hop and his art vs. a normal life. And while you can tell hip-hop would be the obvious choice as an outlet, he's also aware of how it's slowly making him a little more aggressive on songs like 'Free Spirited', which might not always be accurate if he's trying to speak more for the common man like on 'Catch 23' - which gets interesting because he also states he's not much of a political rapper, given that hip-hop is an outlet for him. And hell, that's one of the reasons why the dichotomy of 'Illusions Of Gangsta' actually works, first from the perspective of a hard-edged gangsta to the more conscious guy from the sidelines, who might not be reaping all the benefits but also speaks more honestly and hopes that instead of perpetuating stereotypes that gangsta could be so much more. Paradoxically, though, this is where this album can lose me a bit, mostly because of the closer 'Open Lid', which I'd also probably call the weakest track here as he describes how pursuing his art has pushed down his inner demons and struggles, the indecision and self-doubt that he needs to dump out. And yet as a closer it feels strangely unfinished - he describes how he needs to get out all of these insecurities and frustrations, but outside of snippets we don't get that greater emotional climax to let loose, and placing that song at the end leaves things hanging. More to the point, the information we do get can feel a little scattershot - he doesn't want to be like his father or stall out, and I like some of the overarching metaphors he uses like the pirate imagery on 'All Hands...', but on 'Innoscents' he has the line that he's 'secure with being vague'. Probably true, but for a debut album where you're trying to establish yourself as a unique presence, you're leaving things hanging, and being insubstantial doesn't help pull me back for future projects. Still, good rapper overall and some decent content, so what about the production? Overall... eh, it's good. Most of the beats don't really surprise me or are particularly hard-hitting but they do the job fine. We get a fair number of blurred over pianos like on 'Inquiring Minds' and that riff on 'B.C.B. II', and your darker, watery synths like on 'Innoscents', the oily drip of the melody on 'Free Spirited', or the muted twinkle against the scratchier beat on 'All Hands', which has probably the hook I like the most here along with 'Catch 23', with the faded vocal sample playing off hints of funkier guitar at the back. There are a few places where I feel the tones don't quite work all the way for me - I didn't like that thin layer that crept over the mix on 'Free Spirited', and I otherwise would have totally been on board with 'Illusions Of Gangsta' if it wasn't for the chiptune-esque filter that came after the beat switch. Then there's 'Open Lid'... again, not how I would have ended the project, especially with the pitch-shifting around the hint of guitar, it just felt a little more sparse and clunky than it should, and it felt like the song just lost momentum completely at the end. But overall, I don't mind this project at all - in fact, for the most part I quite enjoy it. If Dead End Hip Hop is going to produce and back more projects, I like that they're in this vein and do show some real potential, but at the same time Damone Tyrell does have a fair amount of room to grow and improve, and I'd like to see a more expanded or even self-contained work, as I feel Who The Hell Is Damone Tyrell? left some pieces hanging. For me, though, this is an extremely light 7/10, overall a recommendation if you're a fan of some rough-edged but intelligent underground hip-hop, and even if you're not it does run circles around a lot of the mainstream, this guy does indeed have bars. In other words, definitely worth your attention, so check him out.